Scanning is still the best method to create a digital copy of a photograph. If you're working with photos, skip to that page, and read that first. But for documents, especially for a big stack of documents, scanning isn't always practical or even feasible. In some cases the condition of the material - say, tightly bound volumes or particularly delicate items - makes scanning with a typical flatbed machine impractical. Sometimes trying to scan the item might result in damage to the original. This is when the digital camera is the right tool. 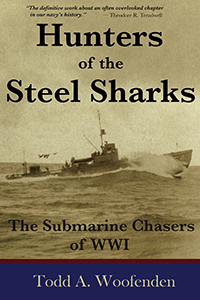 Having spent many hours at the National Archives photographing old deck logs, Ship Movements books and war diaries, I've gained some experience in shooting hundreds of pages quickly. The tripod-and-clip method does the job. I travel a lot to find documents, so I prefer a lightweight, portable tripod. But any old tripod with legs that extend will do. 1. Open up the coat hanger and bend it with the plyers into a long, narrow "u" shape, so that the "u" will slip snugly over the leg of your tripod. 2. Now bend it and cut the ends off, to make a clip, as shown in the photo below. You'll use this wire clip to hold one foot of the tripod to the lip of the table. The clip can be about 3" long and 2" deep, and it will work on most tables. 3. Set up the tripod so that one leg is extended part way and the other two are pushed in all the way. This would normally tip over, so use the wire clip to hold the extended leg, by slipping the clip under the edge of the table. Bend it if you need to, so it holds, and so the foot of the tripod won't slip out of the clip. 4. Set a document of typical size on the middle of the poster board or paper to get a general idea of where you'll want to place the pages for shooting. Using the ruler and pencil, mark a few light lines on the poster board or paper, or a gridwork, or some right angles. These will be reference marks for placing each document on the paper. 5. 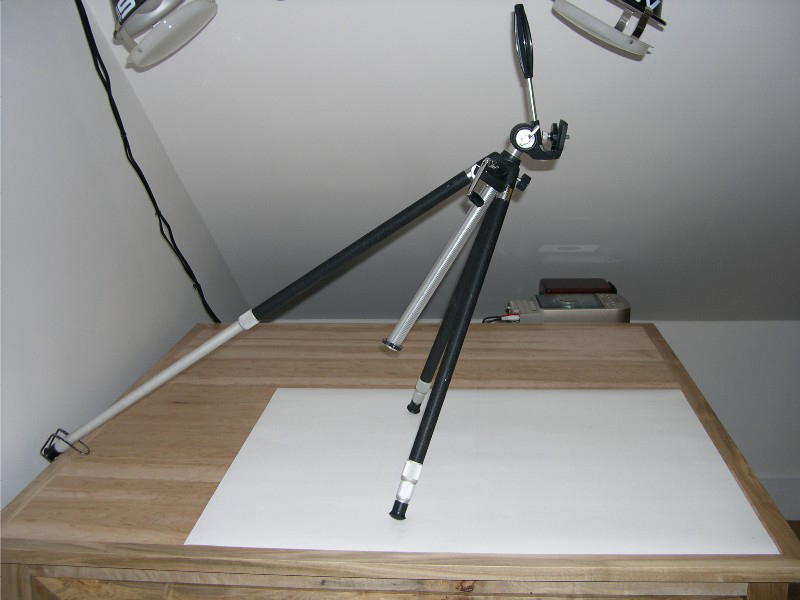 Mount your camera on the tripod, put the poster board on the table, and set up the tripod. Note: Occasionally I've done this on a slippery table, and have needed to place a book up against one of the short legs, or tape one down (after setting the paper in position in step 6), to prevent the tripod from sliding. Make sure it's stable. Don't skip the white paper or poster board step. Shooting paper documents against a wood/dark background tends to confuse automatic camera settings into messing up the contrast and tone. If the background is white, the document - not the table - becomes the notable item that the camera "sees." Turn off the flash. It won't do the job 99% of the time. Get as much ambient light as you can, without putting a lamp right on top of the item. (That tends to cause the same kinds of problems as a flash). Shoot in color. You probably don't have a choice, but if you do, shoot in color, even for black-and-white documents. The readability and printing quality will be MUCH better. Never scan or shoot in grayscale for documents (or photos, for that matter). Try one of the canned camera settings. With my camera, I use "museum," which turns off the flash and assumes the lighting is poor. I've tried fiddling with the various manual controls, but "museum" does about as good a job as I can do manually, and it's easier to select. Shoot in an uncompressed format. Everyone loves JPG images, because the files are small, and practically every software application can open them. But JPG is a compressed format, meaning much of the fine detail is dropped. You get a decent, low-quality image that looks nice on the computer screen, but won't reproduce well and doesn't allow you to zoom in on the details. I recommend TIFF format, but just pick some format that isn't compressed. Shoot in as high a resolution setting as feasible, within reasonable limits. Some of the newer gazillion-pixel cameras frankly don't really offer much except for huge file sizes. You max out at a certain level of resolution, and anything above that is just wasting disk space and processing time. On the other hand, you don't want to end up with a small digital image. You want to be able to zoom in on the document (well, I do, anyway). My document shoots typically result in individual digital images that are around .75 to 1 megabytes each, which is a little on the small side sometimes, but generally does the job. If you pick something larger, that's fine. But if it's trending up in the over-5-meg range, you're probably over-doing it. See if your camera has an automatic setting for "white-adjust," or something like that. It seems like every manufacturer has different names for settings, but what you're looking for is a setting that picks up on areas that the camera thinks are white, then adjusts the color balance to bring up the white. The result, normally, is a photo that isn't all yellow, even if the light is less than perfect. Don't use any sharpening or other contrast/clarity-boosting filters. Sharpening ruins most images. You get a grainy image. If you need to tweak the image, do it afterwards, in a digital image software application like Photoshop. Next: Making a permanent shooting table, on a budget.